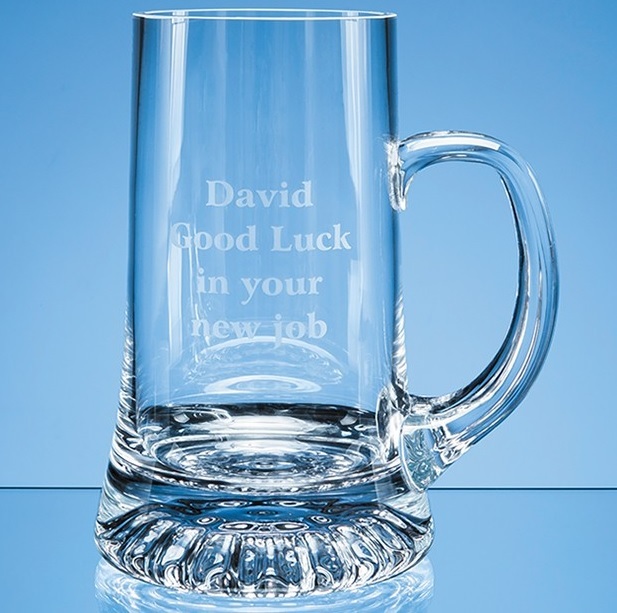 Personalised and Engraved Glass stern tankard. An amazing 1 litre glass tankard with a star cut base, personalised to your exact requirements. It's extremely durable and is suitable for every day use or can be put on display. It benefits from a large engraving area so start creating your perfect gift now! Ideal for thank you gifts at Wedding for the Best Man, Usher, Father of the Bride and Groom, also great for special Birthdays, Anniversaries and many more occasions!! We have a standard assortment of images should you require one or alternatively you can just have text. If you choose to have your own image/logo there is a one off set up fee of £15. This is payable only once, this isn't a charge per tankard. Please upload your image below.